Testing ingredients for industrial use, such as manufacturing household cleaning products, continues to cause unnecessary suffering to animals. Over 4 million live animals were used in scientific procedures in Great Britain in 2015, as reported by the Home Office yesterday. This represents an increase of around 52,000 compared with 2013. Mice, rats and fish were the most commonly used species. Amongst these, 75,640 animals in total were subjected to regulatory experimental testing under industrial chemical legislation, such as those required for household product testing. This included 450 rabbits; 64,452 rats; 3,818 mice; 4 dogs and 6,916 fish. 75 such procedures for regulatory use involved the testing of three household product ingredients. The Home Office has not disclosed details of which ingredients were tested, or for which products. For the second year, the Home Office has reported the ‘actual severity’ of procedures, indicating the level of harm imposed on the animals undergoing the procedures. 8 out of 10 procedures were rated as causing pain to the animals, while a further 6% caused death to the animal under general anaesthesia. The rise in the number of animals used for all experiments is extremely disappointing. The UK is a nation of animal lovers, and our community cares deeply about their welfare. To know that, in 2015, almost 8 animals per minute are still subjected to experimentation should keep our leaders awake at night until the suffering and waste of life ends. In 2015, the government ended the testing of finished household products, but is yet to change legislative requirements for testing of individual ingredients. Now, the Home Office’s report has highlighted the urgent need for such change. With our pending exit from the European Union, protections granted to animals under the EU Directive that governs the use of animals in experiments could be under threat. Even more animals may be subjected to cruel and unnecessary procedures in coming years. 4.07 million live animals were used in scientific procedures for the first time in 2015 - an increase of 52,000. The Home Office ranks severity of procedures as either sub-threshold, non-recovery, mild, moderate or severe. 81% of the procedures were rated as painful to some degree. Of those, 123 thousand inflicted severe pain, including those animals who experienced suffering so severe it killed them. As 8 out of 10 animals experienced pain or discomfort in these procedures, and 4.07 million animals were involved in procedures overall (almost 8 animals per minute), this equates to over 6 animals per minute experiencing pain or discomfort in experiments. A further 123 thousand were assessed as ‘non-recovery’, meaning they were experimented upon while under general anaesthesia and died before awakening. 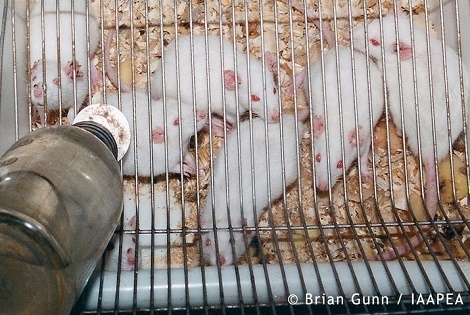 76 thousand (14%) animals were subjected to experiments under industrial chemicals legislation. Demand development of non-animal alternative testing methods in order to fully replace the use of animals as quickly as possible. They can begin with a ban on testing of all ingredients for household products. Until all animal experiments end, our leaders must ensure animal welfare standards for scientific procedures improves. As consumers we must use our purchasing power and choose cruelty-free household and cosmetic products for which no animals were harmed. Naturewatch Foundation has already done the hard work for you! To help make it easier to be a compassionate shopper, we’ve produced a series of handy guides to cosmetics, personal care products and household cleaners. Click here to order yours now. If you’d like to help support our work, please email info@naturewatch.org to find out more about volunteering, or make a donation by clicking here.